1895, the journal of l’Association française de recherche sur l’histoire du cinéma (AFRHC), has published a special issue on the work of Emile Cohl (1857-1938), the brilliant French graphic artist and pioneer of the animation film. 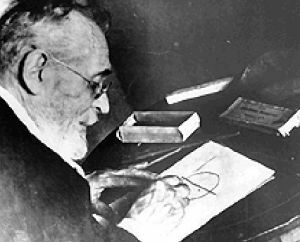 Cohl (born Emile Eugène Jean Louis Courtet) first established himself as a caricaturist, cartoonist and writer in the 1880s/90s. In 1908 he joined the Gaumont film company, originally as a writer. He soon graduated to directing comedy, chase and féerie (magical films in the style of Georges Méliès) films, but then moved to making animation films, a kind of film only just starting to be created, largely through the example in America of J. Stuart Blackton, whose Humorous Phases of Funny Faces (1906) and Haunted Hotel (1907) opened up a whole new world of cinematic possibility. Cohl worked with line drawings, cut-outs, puppets and other media. He also took the idea of animation one step further by cresting a character, Fantoche. 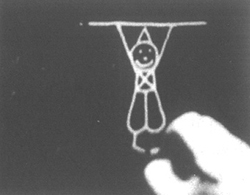 His first animated film, the delightful stick figure Fantasmagorie (1908), is held to be the first fully animated film, employing 700 drawings on sheets of paper, each photographed separately. Cohl developed a distinctive personal style of animation, where a figure would metamorphose into some unexpected different image, taunting notions of reality and logical sequence. Cohl made over 250 films between 1908 and 1923, working for Gaumont, Éclair (including a spell in America), Pathé and others. Thirty-seven (some of uncertain attribution) survive in film archives, and Fantasmagorie is available on Lobster Films’ Saved from the Flames DVD. There is an elegantly designed website (in French), www.emilecohl.com. He is also the subject of an exceptional biography by Donald Crafton, Emile Cohl, Caricature, and Film (1990) which I warmly recommend, not only for being a thorough, readable and richly illustrated account of his life and works, but for all the context it provides for French cultural life, graphic art, and the early film industry. The special issue of 1895 is in French, though on the 1895 website there are abstracts in English. A couple of the pieces are available to read in full (in French). There is a family history from Pierre Courtet-Cohl, an articles not just on his animated films but on his work in caricature, photography and cartoon strips. A proper DVD anthology of Cohl’s work would be seem to be more than overdue. Beware of some films on YouTube credited to Cohl which are not his work – Fantasmagorie (alas, ripped from the DVD release) and Le Rêve D’un Garçon De Café (aka Le songe du garçon de café or The Hasher’s Delirium, available only as a brief extract) are his; The Automatic Moving Company (confused with Cohl’s Le Mobilie fidèle) and Le Ratelier are not. Great blog! I have added you as a link on my blog, the http://www.emilecohl.com website is down, so I put you in it’s place because of the nice bio of E.C. you have. Thanks! Thanks for the kind words and for the information on the Emile Cohl site – I hope it’s just a temporary thing. I have been spotlighting early animators on my blog and have posted a link to your well written entry on Emile Cohl. Keep up the excellent work!